it's that time of year here in new york city. cold. windy. bitter. horrid. treacherous. barbaric... i mean cold. i know that when the scarves come out, so does the porridge. and i love it. so today, i'm going to give you some porridge inspiration; some of my favorite recipes from my favorite blogs and photographs of my own. 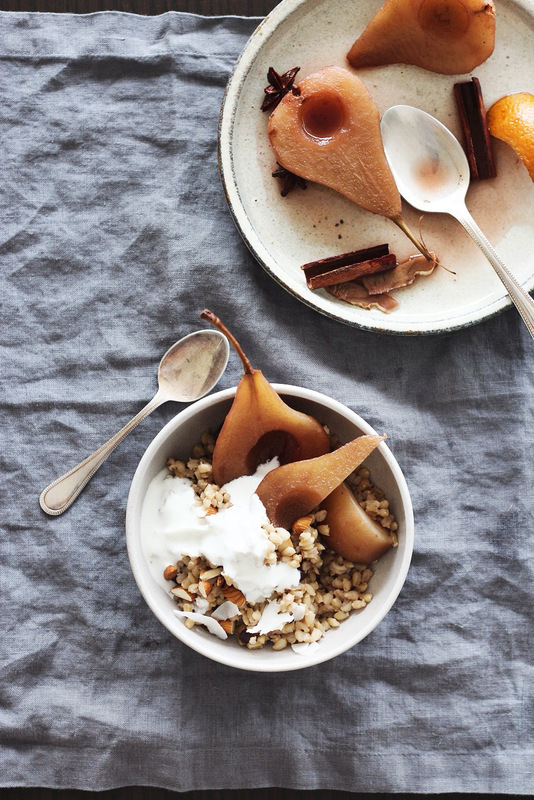 luise and david from green kitchen stories share this wonderful raw buckwheat porridge recipe. while it is not a traditional, warm porridge, it's just as tasty. i would recommend this one if you're in a hurry in the morning (as you can easily make it the night before). personally, i make this recipe pretty often– i love the nutty taste of raw buckwheat and the sticky-sweet consistency. and from one of the most well-photographed blogs on the entirety of the internet: "super delicious overnight bircher muesli" from what should i eat for breakfast today. generally, bircher is very simple, combining yogurt, oats, grated apple, and some (almond) milk. exotic toppings and flavors are optional, but totally recommended. if you want a simple, classic bircher recipe, this is it. lastly but not leastly (.......?!!? ), i'll share my own personal recipe that i make on a every-other-day-to-day basis. it's really simple, but adaptable. it never seems to fail me. 04/ serve in a bowl, top with fresh fruit (maybe more bananas), nut butter, seeds, and/or dried berries. enjoy. breakfasts like these are especially great on test days (which is every day). just saying.